When you become injured in an accident, you are faced with many important decisions many of which must be made in a short period of time. Though every case is different, one fact is common to all personal injury cases: you must not expect the insurance company to protect your rights. Insurance adjustors don’t work for you. They are hired to protect their employer and their employer’s shareholders. 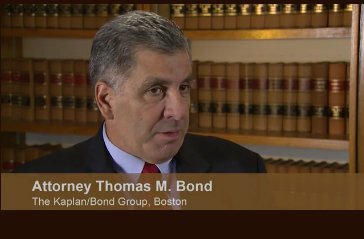 THE KAPLAN/BOND GROUP is recognized as one of the leading personal injury trial firms serving injury victims throughout the Boston metro region. Experience, personalized attention, and dedication to your recovery are only a few of the things you can expect from our trial attorneys. Workers’ Compensation – Is it all I’m entitled to? Through the years, THE KAPLAN/BOND GROUP has achieved an excellent record of verdicts and settlements on behalf of victims of negligence. Because our law firm is small by design, we can work very closely with each client and provide the personal attention required to resolve legal issues effectively and efficiently. You won’t have to worry about being passed around among legal staff, and you will always receive prompt responses to your calls and emails and questions and concerns. Our individual approach is evident in even the most complex, multi-party personal injury case. We work with independent professionals to ensure the evidence is clear and well-presented. During settlement negotiations and trial, we meticulously prepare with the most recent technology, including 3D animation, Day in the Life ofvideos, plot mapping, photography, video witness interviews, multimedia presentations, and much more. Our detailed presentations highlight the negligence that caused the injuries and enables our firm to illustrate what our client has gone through and shall continue to go through for the rest of their life. In order to recover the maximum compensation available to our clients, we assess all available means of recovery. This is of particular importance in work accident cases when the injured employee is barred from suing their employer. While we capably assist them in pursuing full workers’ compensation benefits, we also pursue third-party negligence claims against other parties who can be held legally responsible. No matter how simple or complex your case may be, we have the experience and resources necessary to maximize your recovery. Contact us at THE KAPLAN/BOND GROUP to schedule a free consultation. All personal injury cases are taken on a contingency fee basis, meaning we don’t collect attorney fees unless we recover compensation for you. With offices located in Boston, Massachusetts, we will arrange a meeting at a location that is most convenient for you and your family – even if that means coming to you!